Ertl was born in Stuttgart, Germany, where he studied physics from 1955 to 1957 at the Technical University of Stuttgart and then at the University of Paris (1957-1958) and Ludwig Maximilians University in Munich (1958-1959). 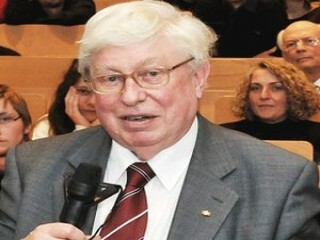 He completed his Diplome in Physics at the Technical University of Stuttgart in 1961, followed his thesis advisor Heinz Gerischer from the Max Planck Institute for Metals Research in Stuttgart to Munich and received his Ph.D. degree from the Technical University of Munich in 1965. He always used new observation techniques like low-energy electron diffraction (LEED) at the beginning of his career, later ultraviolet photoelectron spectroscopy (UPS) and scanning tunneling microscope (STM) yielding ground breaking results. He won the Wolf Prize in Chemistry in 1998 along with Gabor A. Somorjai of the University of California, Berkeley for "their outstanding contributions to the field of the surface science in general and for their elucidation of fundamental mechanisms of heterogeneous catalytic reactions at single crystal surface in particular." Gerhard Ertl was awarded the 2007 Nobel Prize in Chemistry for his studies of chemical processes on solid surfaces. The award, worth SEK 10 million (US$1.7 million, GB£1.15 million), was announced on Ertl's 71st birthday. "I am speechless", Ertl told Associated Press from his office in Berlin. "I was not counting on this." View the full website biography of Gerhard Ertl.